It is very difficult for me to believe that some of the friends that I went to college with now have GRANDchildren. You know how your brain feels when you try to wrap it around a concept and it just keeps going round-and-round because it can't fully accept it? Yeah. I think it's because I still think of us as those 20-something-year-olds we were back then. We are now awesome 40-something-year-olds, but since many of the memories I have of them were made while we were in our twenties (I haven't seen many since then), my brain is trying to make the adjustment. I am saying all of this because I am making a baby sweater for one of my "Grandma Homies". 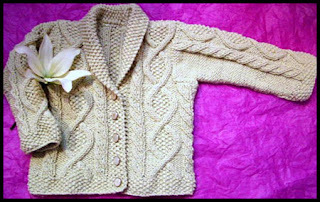 How could I say, "No", when, after requesting a baby sweater, she promised she'd brag about my knitting skills to her friends? The pattern that I chose to make is "Trellis" from Knitty.com. I'm knitting this in the 6 month size and my goal is to finish this quickly. I have completed the back and left front, and I'm almost done with the right front. 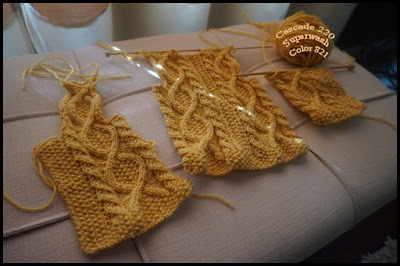 I think I might work the sleeves two-at-a-time to make this go quicker. This is the second time I've knit this sweater and I love it for the "wow factor". Non-knitters see the fancy stitch acrobatics of the cables and think you're a knitting goddess. This sweater will only take two balls of Cascade 220 Superwash (I wish a sweater for me only took two balls of yarn. ).